A boiler is basically a closed vessel that uses a fossil fuel or electricity to create hot water or steam for space heating or domestic hot water. In hot water systems, a network of insulated pipes and heating elements distributes 160°F to 180°F water for space heating, then returns the cooled water to the boiler using either gravity or a pump. Hot water systems are typically found in residential and small commercial applications. Steam systems operate similarly to hot water boilers although they have different piping arrangements and operate at 212°F and at higher internal pressures. Steam systems are often used to heat a complex of multiple buildings due to their ability to retain higher heat values longer. 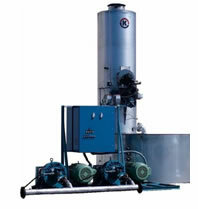 Multiple, smaller boilers can be ganged for some larger applications. This allows the boilers to act in a modular fashion that improves efficiency, reduces emissions and prevents a no-heat situation if a boiler fails. In a modular system one small boiler, operating continuously may carry the entire heating load during moderate temperatures. Additionally, multiple small boilers make it easier to install and access the equipment in a small or tight existing boiler room. As a boiler alternative, direct contact water heaters (described in the Water Heating module) offer several advantages. Unlike pressurized boilers, direct contact water heaters operate at atmospheric pressure eliminating the need for a full-time boiler engineer, boiler permits and annual inspections, and the higher insurance rates associated with a pressure system. The water heaters also do not require the chemicals and frequent maintenance of a boiler. Direct contact water heaters boast a superior heat transfer system that delivers significantly higher efficiency and lower emissions compared to conventional heat exchanger technology. 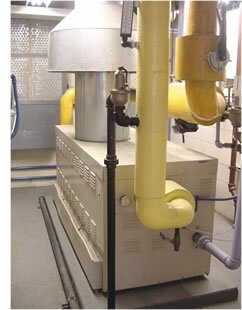 The major boiler types are watertube, fin tube, firetube, cast iron sectionals, pulse combustion, and electric boilers. For a thorough discussion of boiler basics, descriptions of the various types of boilers available, and much more about boilers, visit the Boilers module.